At 0054 hours, the Union Fire Company No. 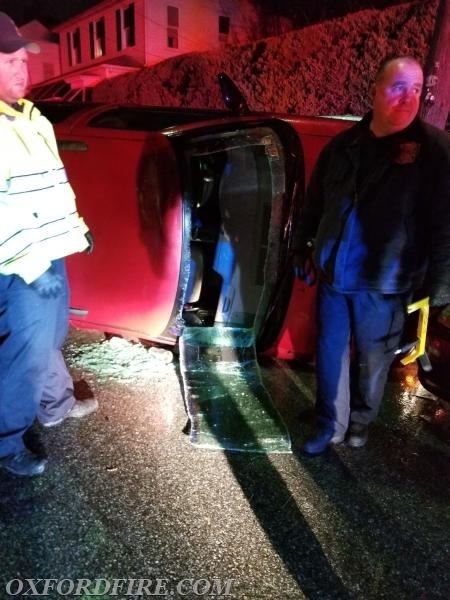 1 and Medic 94 (SCCEMS) were alerted for a reported overturned car with possible entrapment in the unit block of South Fifth Street in the Borough of Oxford. Ambulance 21-2 and Ambulance 21-3 arrived within minutes to find one vehicle overturned with one subject still inside and unable to get out. The EMS crew worked to removed the windshield and the rear window to better access the Patient. Chief 21 (Meadowcroft) arrived and established the "Fifth Street Command". Rescue 21 (Lt. Vitanza) arrived and the crew stabilized the car with cribbing and the rescue struts. The crew then utilized the front bumper rescue tools and reciprocating saws to cut the roof and flap it back to allow for Patient removal. Engine 21-1 (Lt. Kelley) arrived and the crew assisted at the scene with the extrication. 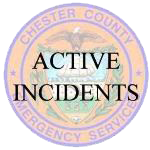 Once the Patient was removed and turned over to the EMS crews, the Patient then transported to the Christiana Hospital in Delaware. Crews remained on the scene cleaning up and securing hazards. The final units were clear of the incident at 0157 hours.